I'm not sure how this happened but I suddenly get SO SICK if I eat an egg. I have tried over a month or so to test it, and sure enough everytime I eat one... just an egg, I get feeling so yucky. It will go away after a few hours, but man! So, I called the Dr. today just in case, to see if they knew what the deal was, if it was a common problem, and if there was some reason for it? SOLUTION: STOP EATING THEM! duh!!! aND SO noW i gET tO eNjoy A TREAT... dR'S OrderS! sugar for rolling dough in. cream shortening and sugar until light and fluffy, add molasses, egg. Combine dry ingredients seperatley and add slowly to wet ingredients. roll dough into 1" balls and roll in sugar. bake 350 for 12 minutes. Weird - egg allergy, huh? Your cookies look yum. I'm not sure what artist you're talking about. Get more info and let me know because those things make me crazy without knowing. So when are we going to get together again? I can't eat eggs either...they make me puke! 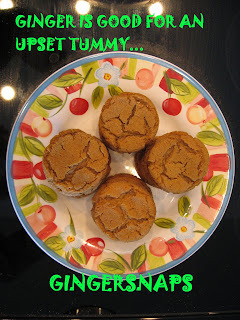 hey, how does that work, if there are EGGS in gingersnaps? Sure your DR. Said that!......And my doctor said that because MILK gags me I should eat Diet Coke and Chocolate!!!!! hahahahah Just kidding!!!! THose cookies look divine!!!!!!!!!! You know those have always been my favorite! And now "SO GOOD FOR WHAT ALE'S YOU!"